Escape the busy city to peace and quiet! 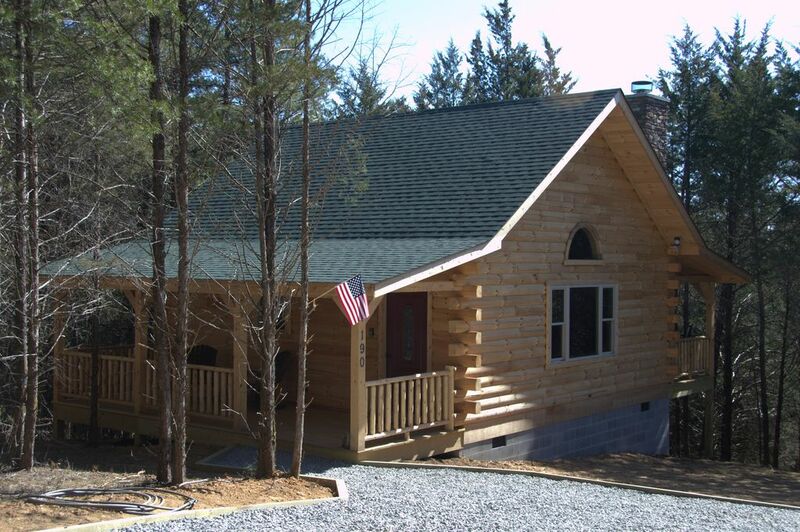 Visit High Bridge Lodge and Cabins located in Farmville, VA. Our cabins are nestled away in a beautiful, private wooded area, and offer easy access to the High Bridge Trail State Park. The Weekend Getaway Cabin features one bedroom and one full bathroom, as well as a full size sleeper sofa. Central heating and cooling. Fully equipped kitchen. Great Room with wood burning fireplace, flat screen TV and DVD player. (Internet wifi is available) Outdoor fire ring with plenty of seating. Large front porch and back deck to sip your morning coffee or relax to the sounds of nature. Electric grill on back porch. Linens and towels are provided. We supply a reasonable amount of trash bags, paper towels, toilet tissue, dish and hand soap. Guests may bring additional supplies if they wish. Visit Downtown Farmville for a variety of shops and restaurants that are only a short distance from the cabins. Guests must be 21 years or older to rent. Guests under 21 years old must be supervised at all times by parent or guardian. ​Absolutely no Hunting, ATV’s, Fireworks or Weapons (including Paintball or Air Guns). AWD/4WD is recommended in the winter months for inclement weather. Vilmer's cabin was awesome. We enjoyed the privacy and the quiet. Nothing like sitting on the back porch at night and listening to the sounds of the woods. Thank y’all for coming. Glad you enjoyed it and sorry I didn’t get to meet y’all. Hopefully you can come again sometime. We could not have been happier with our late December stay at the Weekend Getaway Cabin. The cabin is set back in the woods and closely surrounded by trees. There is minimal road noise and near total seclusion. It has a wonderfully cozy feel, even with the high ceilings. The kitchen has everything you need for a weekend and the bed is very comfortable. Our biggest struggle was deciding which porch to sit on. We eventually settled on back porch coffee and front porch wine, since the front was decorated with lights and garland for Christmas. The weather was unexpectedly warm for our visit and walk on the High Bridge Trail, which you can easily access from the property. This led my wife to forget her winter jacket in the bedroom closet. Wilmer graciously took the time to get it back to us, going above and beyond as a host. Cannot recommend this property enough! Thanks for your review Mike. Glad y'all had a great time and hope to have you back again sometime. New, clean, just what my wife and I have been looking for in a cabin. The fire pit area was also well done. Very clean and accommodating. Enjoyed the peaceful surroundings and nice hiking trail. Would definitely stay there again.